Baños is a beautiful town nestled among sizzling volcanos and the Amazonian foothills, in central Ecuador. A popular tourist destination, Baños is the ideal place for both the adventure traveler and the aspiring expat just looking for a pleasant, lively place to settle down. Without a doubt, the city’s most prominent landmark is the very, very active Tungurahua Volcano which towers overhead, thunders the skyline and keeps this rumblin’ town alive. Despite its proximity, the projections of the volcano’s blast and direction of the winds blow southward, keeping Baños safe– at least for now! Because of its exciting location, it’s not uncommon to encounter scientists and volcanologists from around the world wandering the city streets. Volcano watchers have found their personal paradise in Baños– you can hike up many of the city’s adjacent foothills and catch a glimpse of the majestic mountain blowing its top. We recommend hiking at night, when the volcano’s hot red lava lights up the mountain top like fireworks. But volcanoes aren’t the only thing Baños has to offer. The city has also been called the “Gateway to the Amazon”, as it’s only a short distance down the hills before finding yourself surrounded by dense jungle and cloud forest. Jungle excursions are advertised everywhere in the city, making it a destination for thrill-seekers of all varieties. 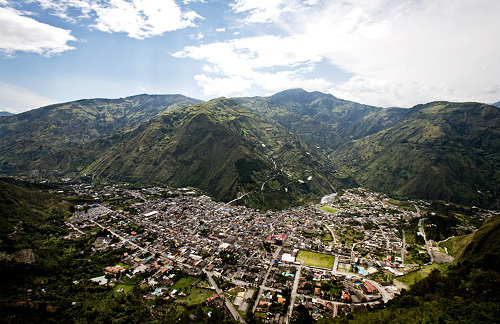 Though even if you’re not a big adventurer, Baños has plenty of luxury attractions too. Most notably, the city got its name from its soothing hydrothermal springs, rich with minerals. The streets are also filled with charming stores with Andean and Amazonian goods from across the region, including its famous sugarcane-produced taffy. Cafes and restaurants in Baños also offer some scrumptous, creative eats. You’ll be hard pressed to find a town with this rare combination of landscapes and cultures anywhere in the world. Volcanos & mountains, jungles & sugarcane taffy– oh my! And yet, it still retains a small town feel which is welcoming and homely. I live in Ecuador and it is a wondeful country. Its people are so nice and kind. I have put together a helpful fact sheet, and an article on Ecuadorian manners and customs. Hi, we just returned form 3 mos in SA, one of which was Ecuador. We have been looking for a place to retire and after many years and over 50 countries we think Ecuador may be our choice. We are trying to avoid “gringoed communities” and find a qquieter more local feel. Banos, Vilcabama, and Otavallo were all nice, and to be fair we did not get “outside” of Cuenca but suspect it is a bit done for our taste. Like always, there are areas that are not as well known that might be what we are looking for. We will return this fall and spend perhps 4 months looking at different areas. As always, we are interested in anyones experiences. I have been living in Cuenca for a year and love it, but it is too cold and cloudy for me. I’d like to find out about apartment rentals in Banos, but can’t find a thing.